Energy was not only the subject but in the air at the GEFA Biogas Technical Assistance Workshop in Peachtree City, Georgia last week. 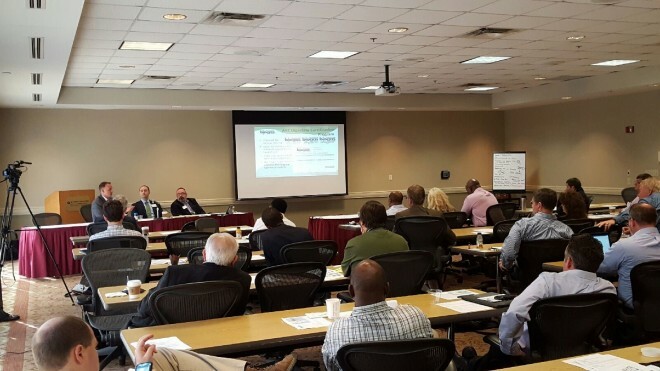 For weeks we had planned for it, arranging speakers, researching case studies, and soliciting calls to entice municipalities to attend, and it was finally time for the culmination of our efforts, the GEFA BTAP One Day Workshop held at the Wyndham Hotel and Conference Center was about to take place. I realized that some of the firms attending who would be sitting together on panels were actually competitors in the energy world, but what I wasn’t expecting was the vitality, vivacity and vigor, otherwise known as energy that filled the room. There were wastewater treatment plant and landfill operators and managers who may have the capacity to make energy, but were not sure exactly how to go about it, and/or who came to learn how to apply for the available GEFA funds. That in a nutshell was the purpose of the event, to learn and connect with energy experts, hear about successful operations and approaches, and discover what the next steps are to get started in obtaining funds to harvest renewable energy from your operations. Gus Simmons of Cavanaugh and Associates who facilitated the event gave the overview and purpose, and explained what we hoped to accomplish. Andrea Schroer, who coordinates outreach programs and manages the grant funding program welcomed everyone and started us off with introductions, to get the participants involved. For the opening, three dynamic speakers, all advocates for renewable energy sat on a panel. Patrick Serfass of the American Biogas Council, who has a wealth of knowledge peaked our interest as he explained what is happening across the USA. David Cox of the RNG Coalition spoke about how renewable natural gas development and deployment will replace the fossil fuels making clean energy for future generations. Gus Simmons rounded out the panel, a passionate advocate for renewable energy, he helped the audience fuel questions for the group. 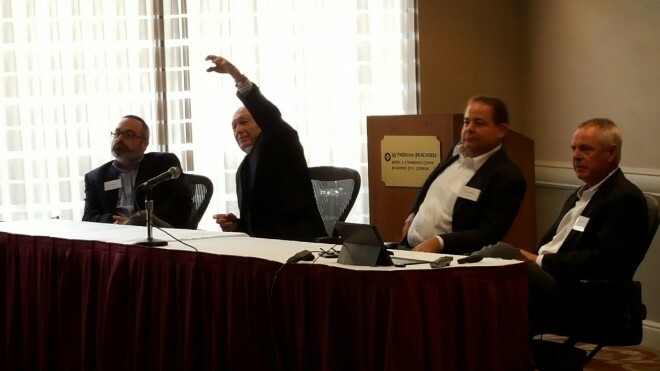 These two agencies both renewable energy advocates had never sat the same table before, and their discussion of the current state of the biogas industry evoked many questions from the audience. The next panel made up of energy experts discussed case studies in the United States where biogas is being used to generate CNG, electricity, and RNG, and portrayed how these technologies are being used to fuel public and private fleets, waste collection vehicles, sheriff’s department vehicles, buses, etc. These examples helped participants visualize how energy from their projects could be utilized. A biogas project evaluation tool was also discussed. The Biogas Technologies session delivered the actual processes used such as biogas clean up, CNG, RNG, and biogas upgrading technology examples. Some forms of co-digestion provided potential revenue for the municipalities. Co-digestion of food waste, and FOG with wastewater treatment plants was also explained. The next session of Industry Partners in the Southeast, was my favorite which included an energetic panel of knowledgeable speakers who discussed off-take agreements, and what is driving the market and industry. Ian Skelton of AGL Resources, who leads an operations team who builds, owns and maintains CNG stations for fleet customers lead the discussion and talked about the development of CNG projects. Don Francis of Clean Cities-Georgia gave us an idea how utilities and cities are powering their vehicles on CNG, and Mike Casteel from UPS talked about how most of their fleet in the USA and Canada is running sustainably on CNG, and his fleet related procurement activities. It was refreshing and encouraging to realize that although we are far behind Europe, that America is definitely making forward progress and advancing in renewable energy. Andrea Schroer and David Cox finalized the event talking about off-take agreements, equity investor partnership and GEFA Programs to help WWTP and landfill operators know what the possibilities are and direct them to the next steps for completing the application. The Workshop was very educational, and I learned a lot about RINs, RECs and RNG, and was happy to see and hear the follow-up conversations that will hopefully lead to feasibility studies. As this was my first renewable energy workshop, it is enlightening to experience and be a part of forward progress in promoting clean energy in place of fossil fuels.